Albert Benner came to New Zealand from Ireland on the ship Dunfillan, later renamed the Mataura. The ship left Gravesend on Sunday a.m. October 26, under Captain Kerr, with 158 passengers. It arrived in Dunedin, on Friday January 16th 1874. Thanks to Roger Searle for making this document available online. Account of journey from London to New Zealand via Cape Of Good Hope, October 1873 to January 1874. From the diary of John Thomas Searle, Swiss Cottage, Kent Road, St. Denys, Southampton, Hampshire, England. Father of Walter E. Searle, later of Oamaru, New Zealand. John Thomas Searle started on the London and South Western Railway March 1854. Left the service October 22, 1873. 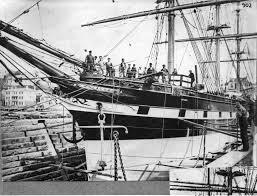 Joined the ship “Dunfillan” (853 tons) in the South West India Docks, London October 23, 1873. Left Gravesend Sunday a.m. October 26, Captain Kerr, 158 passengers. Arrived in Dunedin, Friday January 16th 1874 with family. Went from Portswood Station to Bishopstoke Station by the 8:35am train, then changed into 8:45am up Southampton train for Waterloo to settle for a passage to Otago. Sarah Ann and little Harry went home to Sussex from Protswood Station by the 10:10am up Southampton train. The whole family went to St. Denys Church, Southampton on Sunday morning October 19th 1873. George and I went to church in Dunedin, New Zealand, January 18th 1874, in the morning, at All Saints. Day 1 – Portswood, Southampton. Thursday morning, October 23rd 1873. Up all night packing and roping boxes. Brother Wm helping. Breakfast early. All confusion. Went round to say farewell to several neighbours. Some up, some not. Some in night clothes at the windows. John O’Ryan and Charles Pierce got the luggage down to the station. A very wet, cheerless morning. Started for the Portswood Station at 6:45am. Was met there by many of my old fellow servants, including the late Inspector Lunn of the P.W. Started from the station at 7:10am. John Smith – driver, Thomas Smith – guard. Had some ale with them opposite the Waterloo Station. Mrs. Wm. Miller, in the same train, came to us at Basingstoke and brought two bags of buns for the children. Arrived at Waterloo alright. Dad to see M. Scott, the manager, who granted me a covered two-horse van, which took us all to the South West India dock. Rained all the way. The ship “Dunfillan” [???} one, four years old. Went on board after waiting a few hours in the baggage warehouse. Had roast beef and hot tea. All confusion. Fanny and Emma – parted with them as soon as we got on board, saw them next morning, all well but for . . .
All confusion and wonderment. Saw Robert Redford and James Lind same night. Went to bed about 9 o’clock after a little music and dining and a great deal of laughing at going to bed. Rose at 6:30. Appointed Captain of . . .
A fine set out . . . the children. Then had breakfast, also opened one of the chests for a lost box. All busy getting baggage on board. Went with Robert and his father ashore to buy some things. While gone, the ship left the docks. Got on board again at one of the lock gates, several other passengers scrambling on board. A bundle fell into the water, fished it up again, when the bottom gave way and some things fell out and were lost. J Redford came on board again with a bottle for a passenger. Had a job to get ashore again. Tug boat started with us at 2:20am for Green Hyde, where we lay all night. Good deal of confusion. Sent a letter to Father by a lady going ashore. Day 3 – Saturday October 25th. Sailed. Started from Green Hyde at 10am. Arrived at Gravesend at 1:20pm. Passed the Doctor and another gentleman at 4pm, and two gentlemen came on board and gave away two bags of books. One of them prayed. Came on to rain. Had supper and went to bed early. A poor family named Pumphrey lost all their money coming on board. Drew up a paper and collected [pound sign]1.46. The poor man wept, having lost the few shillings he had. Got up at 6:15am. Had breakfast early. A gentleman came on board and gave away one bag of books. Fine morning. Started from Gravesend at 9:15am. All well. 10:15am the carpenter threw a new . . . overboard. 10:30am passed the Great Eastern lying at Thurnap. Tug boat left us. Alice and Emma Jane a little sea-sick. 5:15pm passed Ramsgate. At 5:45pm River Pilot left with three cheers and at 6:45pm, fine starlight night, all going well. Had to go on watch in out department from 12 to 3am. Fine morning with a fair wind. Had breakfast. None sea-sick. Sun shining brightly. Passed the Isle of Wight at 7am off Portland. A little music and dancing going on. Now for a good hot pork dinner and pea soup. Little Harry rather sick. Several ships in sight. Wrote a letter to Father and sent it ashore by the Channel Pilot, who left us off Plymouth. Gave him three hearty cheers. The Captain and doctor paid a visit to all, also pulled the old ship’s cook out of bed, for being in the same, being ill, they say, from drink. Singing to music on deck. Had a little bread and jam for supper and a tot of brandy to finish with. Did a little carpentering for the doctor, such as nailing a few chests to the deck to keep the things steady. We’ve a fine starlight night with a fair wind. All going well. Now for bed. Fine morning. Wind dropped a little at 3am. Breakfast 9am. Ship rolling a little – not wind enough to keep her steady. Several more in sight. Alice very giddy but not sick. A little music on deck but much more down below with the infants. The noise of them is almost unbearable – never heard such with them in my life before. Had biscuits for the first time. The mate found a young man stowed away in the fore hold. Set to work his way out, by the Captain’s orders. A small bird flying about the rigging. Helped to make six short forms. Music and dancing – rather too much noise for the good of some who are bad in bed. A great many very giddy. Fine night and fair wind. Went to bed early. Fine morning. Fair wind in the Bay of Biscay. All going well. Some very giddy. The crew busy washing down decks. Saw a small bird on the deck picking up crumbs – flew away into the rigging. Several sword fish were seen. N.Z. mutton for dinner. A number of the passengers begin to wish they had not come, but I say it is now too late to repeat, for there is no back door to this house – almost a cabin. Ship rolling very much. Fine night with a good deal of noise and confusion. Nothing but rolls all night. Fine morning but no wind. Several small birds flying about the rigging, that we brought from Lands End. Several people sick. Alice a little better. Begins to rain a little, every prospect of a rough night. Ship not rolling quite so much. Feel very sick and giddy and a great many other passengers also. Not quite so much music and dancing. Passed not a very rough night. Ship sailing along first rate. Out of the Bay of Biscay early this morning. Fair wind. All a little better. Our little birds still with us, flying about the rigging. We are now, at 7:30pm, opposite the Portuguese coats. A great many on deck. Dancing. Plenty of music. A fine night. Our good ship flying along. Had a good bread and cheese supper with a glass of stout. Passed a rough night. A great many sick and giddy. About 9am had a bit of a squall. A rough unpleasant day. Shipped a little sea at times. Sarah Ann bad with a bilious attack – very sick and went to bed in the afternoon. Going at the rate of ten knots an hour. Passed a rough night. Many sick and giddy. Sea rather rough. Got wet through two or three times. Keep shipping seas. A very unpleasant day. About 2:30pm came on to rain. Sarah Ann better. A meat pie for dinnier, Mrs Hughes put into a swing berth very ill. Passengers falling and flying about in all directions. About the worst Sunday I ever spent in my life. People repenting over coming to sea. Ship rolling very much. Sighted no vessel. The sea not quite so rough. Scarcely any wind and that not very favourable. All the women except Mrs. Hughes up on deck. The sun shining. Cleaning up a little below. Store keeper selling lemonade at 6^ per bottle. Sold a great quantity. At 4pm, two ships in sight to windward. Passengers all seem better. Ship not rolling near so much. A turtle near the ship to windward was seen. Spend a very comfortable day after two rather rough ones. Singing, dancing and music. A fine starlight night. Had a good run in the night. Wind in our favour. Sun shining bright. All the passengers better – Mrs. Hughes also. Everyone busy, this being the day for having the boxes up out of the hold. Everyone in good spirit having hte chance of getting some of the good cheer in store in the boxes. At 3pm, three ships in sight to windward, one very near. More like a fair than being on board ship at sea. Fiddling and dancing going on. A fine night with a little more wind. A fine hot mornning, not much wind. About 9am a large black looking bird about a quarter mile astern. Two ?barques? in sight – one an American looking, very near our own. About 11am, a little boy named Sutton fell down the hatchway and cut his chin open two inched. The doctor sewed the same up. Boy doing well. Mrs. Hughes getting better. Came on deck this morning for the first time. A ship in sight, homeward bound, making three altogether in sight. Washing day among the women. Music and dancing. A fine night. All going well. A fine morning, wind in our favour. The same American vesel in sight, also a steamship and another vessel in sight. Got up at 3 o’clock. Had to keep watch until 6 o’clock. A fight nearly came off between the baker and one of the passengers – the latter calling the former a thief and liar – in the first place in the morning. In the afternoon, they began again about religion but made it up afterwards. Also a little of disturbance between some of the single men and the doctor and in the morning the Captain talked a bit to them with regards to the regulations of hte ship. Dancing all the evening, afterwards, hanging up by the heels with a rope to each foot, and walking on the hands and chalk-marking the deck. Fine sport was this. Not much wind but a fine starlight night. The American much further astern. A fine morning, not much wind. The little boy Sutton in the arms of his brother – the latter slipping down the steps again, which frightened him very much. This day had lime juice served out to us. Music in the evening. Passed a quiet night. Not much wind this morning. One vessel in sight, not very near. Beef, mustard and pickles for dinner. John Barlow slipped down the steps with three pints of hot tea, spilling the same all over him. Received a few cakes from the baker. The ship’s steward killed one of the sheep, but none I think will come to our share. Lost a rice pudding and after a little loud talk it found it’s way back into the oven. Had a snarl with the ship’s cook on account of his incivility. Music, singing and dancing. A fine morning with a fair wind. A drove of porpoises in sight to leeward, also a full-rigged ship. Another woman fell down the steps. All the passengers mustered on the quarter deck at 10am before divine service, which was held by the doctor – two flags being wrapped round the capson for a desk. First chapter read was David in the lion’s den – no sermon was preached – most of the people coming out in their best clothes. This Sunday was a little better than the last. Some slipped back and did not attend the service. A fine day. A fine morning. Had breakfast on deck. A whale was seen to leeward, also one ship to windward. The Captain had words with the chief officer at 1am for having all hands furling sails with scarcely any wind blowing – the same being in his cups seven or eight times. After tea helped Lander Walter and O’Keef to put the storeroom to rights. In the morning and afternoon the Captain searched the single men for spirits. Plenty of noise in the evening. Had Wm. to tea. A fine starlight morning. Got up at 3 o’clock to keep watch until 6am. Much sooner have been in bed. The baker is busy at 4:30am mixing the sponge for baking. Had some hot coffee with William in the forecastle. Also had a turn at the pump. Mrs. O’Keefe gave up being nurse to the sick. 12 noon, a vessel in sight astern. Washing day among the women. A little blow between O’Keefe adn little Joe, the doctor parting them – Joe . . . a loaf of bread. Joe reports the case to the Captain. O’Keefe is sent for to have the law laid down to him. also, if he strikes another passenger he will be put in irons. ?Kowa? seem to be going on all over the ship. I think another turn at sea-sickness would put a stop to all the quarrels for a time. Mrs. O’Keefe making a fuss about short weight in her bread. A day or two single girls had some words. Also a snarl between a tailor and a waiter about who knew most. In the evening a concert was held on the quarter deck – a pretty good attendance. Signals forward not lit, nor have they been for many nights. A good breeze having sprung up bids well for a fine run tonight. A fine morning with a fair wind. Two vessels in sight. Some women washing again today. Very bad in my inside owing to drinking too freely of lime juice. In the afternoon several were practising hymn singing on the quarter deck. In the evening the signal lamps were lit. The wind still in our favour. Not many kicking up rows today. O’Keef moved his quarters to the single men’s place by the doctor’s permission. Robert bad with the tooth-ache. Jimmy Lind a little better. A very little music and less dancing. A very quiet evening. Ship rolled about a good deal in the night. A fine morning. Not very well this morning. This morning assisted Mr Lander and Walker in the storeroom for Mr. Wicks. Had a meat pie for dinner. In the afternoon to windward a Portuguese island was seen a few miles off. One passenger inclined to land if he had the chance. In the morning a full rigged ship was seen astern. Not quite so hot this evening. A flying fish was caught, and given to Mrs. Walker for her breakfast. A little music but no dancing. 9:30pm, still off the coast. Fancy I could see the lights on shore. Fine morning, not much wind. Some islands in sight on the port side. One vessel in sight early this morning. While dressing this morning had the misfortune to break the glass of my watch, which was a very bad job, not having any watch maker on board. Cut Jimmy Lind’s hair, also little Harry’s. All very quiet today. The sailors all very busy at work about the rigging. Very warm, no wind. Very little music and dancing this evening. Fine morning, no wind. Very hot indeed. Two mountains in sight – one they say is seven hundred feet high. Slept near the storeroom door part of the night. Robert slept in a hammock on deck all night, which was the best place considering how warm it is. One of the single women in a fit for nearly an hour. One vessel in sight on starboard side. The sea like a sheet of glass. No concert. Old Mrs. Barlow very ill. The evening passed off rather quiet, with a little music and dancing. Some sharks were seen. A large ship in sight. A fine morning, the wind in our favour. Not quite so hot. Old Mrs. Barlow still very ill. Prayers at divine service offered up in her behalf. Two large brown birds were seen flying round the ship, some saying they were seagulls. An island in sight this morning. Crew, all dressed in their best clothes, attended service which was held in the evening for the first time. The wind still in our favour. We passed a quiet day. Fanny and Emma Jane had tea with us on the deck. Old Mrs. Barlow not expected to live. The wind during the night in our favour, also this morning. We are making good way before breakfast. Saw a fish flying about like a bird. The children going to school on the ??? deck. Old Mrs. Barlow much better this morning. Four or five more flying fish about like birds. The old lady I named as “Barlow” is a mistake. Her name is “Howaith”. We had a concert in the evening and soon afterwards the poor old lady was taken for death and died at 10:15pm. Most of the passengers were up all night. This is a sad event. Rose at 6am. A fine morning. The wind in our favour. At 7:15am poor Mrs. Howaith was buried in the sea. A sad sight to see her friends so cut up. “The Lord gave, and the Lord hath taken away. Blessed be the name of the Lord”. At 1 o’clock had a heavy fall of rain. One vessel in sight to windward on the port side. At 4pm had another fall of rain. Several spoke to the doctor respecting the rations. Fat pork yesterday and nothing to eat with it. This is too bad. Got up at 6am. Was woken at 3:15 by the smash of bottles. A little disturbance during the early morning. Rained hard all day until 5:30pm. Had to keep below nearly all day on account of the rain. The place is very wet and uncomfortable below. The doctor has had a great deal of trouble with Mary Saunders. In the morning saw a flock of boobies, otherwise seabirds. In the evening no wind – almost a calm. Had a drop of brandy from the doctor for mopping up the wet. All very quiet this evening. This has been a very hot and a very wet day. The hatches down and the place below like a pig stye owing to the wet dripping down. A few fish were seen and the Captain caught a pike. Passed a very hot and restless night – no sleep. More rain again today. Nothing occurred afresh. The violin at work a little in the evening. Slept a little better last night. Rather a squally night. AT 3:15am, in a squall, had narrow escape of being run down by anothe ship without any lights – so near that a biscuit could be thrown on board. Thanks be to God for preserving us. Busy part of the day carpentering, making lids for the barrels. Another row about tea time – O’Keef refusing to do his share of the work. Put in irons for 48 hours. Another man was nearly served the same – only the word “bread and water” made him alter to go to his work. Music this evening. Wet and dark. Passed a rather dark and squally night. Turned out a bright morning, a good breeze of wind. Going a little out of our track. Held divine service on the quarter deck. After service had a little cake between us. Had meat pie for dinner. Spent the afternoon on deck with Robert and Wm. During the afternoon Robert had a tooth drawn. Not so hot, but the breeze we have got is quite a treat. Divine service was held in the evening. Still going out of our track. Passed a very uncomfortable night – nearly stifled with the heat in our large bedroom. Yound Harry rather troublesome – had to take him in our bed to make it all better. A few birds were seen, also a fish. Not very well today, or Sarah Ann either. Pork, pea soup and rice for dinner. No vessel in sight. O’Keef out of custody at 5pm. Came back to live with the married people again. A little music and dancing this evening. Killed one of the sheep. A fine morning. Slept on the locker all night. Not quite so hot. Sarah Ann washing this morning. I made the pudding for dinner then went into the store for Mr. Wicks. Had dinner, then went into the store again for a short time. In the evening Mrs. Hill danced a Scotch dance. A fine night. Mr. Sutton had a little ointment on his head – smelt well. We crossed the line at 9:50am. Not so hot as it has been. Did not go to bed all night, neither the night before – too hot to do so. Made Sarah Ann a little tea over the lamp at 6am. Had breakfast on deck at 8:30am. A fine morning with a good breeze. After dinner, a fight between Joe Humphrey and the stowaway. A barque in sight on the weather brow, homeward bound. Another bit of a fight between O’Keef and the ship’s cook. This day Wm. Harris gave up being a quarter master. A few birds were seen this afternoon. A concert was held this evening. Passed another almost sleepless night, the berth being very much like an oven. After the bread had been drawn at 7:30am, a full rigged ship in sight on the weather bow. At 9:30 the Captain signalled to her. The stranger ran up five flags. Our brave Captain ran the ensign up twice, then left it up for five minutes only. A few fishes were seen, also a sea bird or two. A good breeze of wind on our port beam. Another vessel in sight on the lee side, also a few more birds to be seen. After tea, Mrs. O’Keef nearly washed away out of the cabin. A fine night. Not much amusement, only a little singing. Slept on the locker all night. Had a little more sleep. A little shower first think in the morning. Washing day among the women. Nothing in sight this morning, only water. Pork and pea soup for dinner. This day, at 1pm, a vessel in sight on the port side. Took 20 drops of Mrs. Harris’s medicine. At 4:30pm a brig and a schooner on our starboard side, abreast of each other, homeward bound. About 7pm, a brig passed very close on our port side – gave them a cheer. A fine night – good wind – going about 8 knots. No concert or singing this evening. Took four pills and went ot bed. A fine morning, no vessel in sight. After breakfast, Joe’s wife and Mrs. Hughes had some words. Mrs. Walker lost her hat, also some of the single girls, making five lost altogether. The day passed very quiet. No concert held this evening. The doctor, chief officer and carpenter nailing up the hospital door and the store-room partition. Little Walter rather poorly. Went to bed about 10pm. The wind having a spell. About midnight a still breeze sprung up. Soon afterwards one of the sails was blown adrift. Going about 10 knots an hour. No service was held this morning. Shipped several seas. One during ____ came across the hatchway like a river. Another cap lost this morning, belonging to Jack, the deck-boy. A good breeze all day. No service held in the evening. Rather too rough. Joe and the doctor had some words in the morning. On watch from 12 until 3am. Not much wind. Got up at 7am. After breakfast has a general clean-up below – scrubbing etc. The Doctor and Joe Cawthine had a few words. Had up before the Captain – threatened with a month’s imprisonment for gambling. Also had to answer complaints with regards to his mess, he being captain of the same. Mrs. Barlow and Mrs. Hughes up at the same time. A fine morning. Not so much wind. No vessel in sight. Mrs. Harris painted my oil skin coat. Several boobies flying around the vessel. The seaman caught one. One of the first class passengers gave 1/- for the boobie caught last night. At daylight this morning we sighted the rocks of Trinidad in the South Atlantic near the South American coast. At 8:30 passed within two miles of the same. After breakfast we packed away all odd things in a box. Thus we passed the morning. Another small row, between Mrs. L and Mrs. R. No lighthouse on the above rocks. After dinner, had four games of draughts with Robert (2 to 2). Last night John Ede washed his sheets and lost his hat. The evening passed much the same as the others. A concert held forward by the single men for crew. Passed a quiet night. The crew caught another boobie bird. Kept it on deck for some time then let it go. It swam for a while then took wing. After breakfast the boxes were got up on deck. This was a great change of scenery being more like a fair. Opened three boxes. Two were in good order but the last box was mouldy. After dinner more sea birds were seen. After tea spent an hour in the forecastle with William Harris and Robert – then another one aft with W. and R. Coaxing Wheeler to sing a song but without success. At bedtime Walter not very well. Gave him some medicine and put a poultice on. Passed a quiet night – no wind. Walter a little better this morning. Washing day again among some of the women. Received a growl from Andrews and his wife respecting Johnie and the clean clothes. Nothing but rows in the Dunfillan. No vessel in sight or sea birds either. In the evening a concert was held on the quarter deck. The doctor presided. Went to bed about 10. A fine night, not much wind. Passed a quiet night. The wind a little more in our favour. After dinner two sea birds were seen. About 4pm the sails of a ship were seen on our weather side. Jimmy Lind lost his sheet. The Constable found the same in Morrison’s berth. Fanny found her lost body of frock in Polly Saunders’ bag with other Sunday lost things belonging to other people. On watch until midnight. A fine night. Passed a quiet night. A fine morning, very warm. Not much wind. No vessel or birds in sight before dinner but Wm. Vann’s (? )hair in the forecastle. Had salt beef and rice for dinner. At 7:30pm a concert was held forward. ??? ??? chairman, when several of the single men and some of the crew sang some good songs. Killed another sheep in the afternoon. Did not sleep much all night. A pretty good traffic in and out, up and down, at the S. R. . . . Rose about 7:15am. Rained a little, then cleared up. Divine service was held on the quarter deck by the doctor, but no sermon was preached. This morning, rain coming on again. The wind shifted round to the starboard quarter. A little more rain in the afternoon. No service was held in the evening. Had a soda cake for tea. Went to bed about 10pm. A fair wind all night. Slept better, it being a little colder. A fine morning with the breeze in our favour. In the afternoon the baker and L. had some words. In the evening the single girls held a concert among themselves – no-one admitted. In the evening the B and A held a B S. Mr. Wicks gave a pint bottle of stout between myself and Andrews. Walter got a very bad inflammation in the eye. This turned out a very funny night. The ship rolling very much – rolling in all directions – tin plates, lumps of meat, stools, cans, boxes etc. flying about. A large trade done in the fruit trade. Nearly all got up at 1am. The women very busy going on deck, called the doctor, also Mr. Wicks up – a fine noise in the stores. Men and women going from one side to the other. A fine breeze in our favour. A bird and a drove of porpoises seen this morning. Walter’s eye still very bad. Tipperary and Harris had a fight. A fine breeze all night. Passed a very funny night again – things flying in all directions. The treacle casks in the store-room have turned over – made a fine mess – bottles broken, pickle jars etc. turned over. When in comes Mr. Wicks and swears at the sight. A few birds seen during the day. Walter’s eye a little better. Kept down below all day. During the day repaired the stool. We have now two sick women – Mrs. Griffiths and Mrs. Cawthine. No vessel in sight. Passed a quiet day. A fair wind all night. The night passed a little quieter. Sarah Ann’s washing day. Walter’s eye a very little better. No ship in sight. Several birds were seen, also a few whales. In the afternoon another sheep was killed. No concert was held this evening. The air very cold. Went to bed early. A fair wind all night. Got up at 8am. After breakfast Mr. Gibson and some of the crew commenced putting the store in order. Found a quantity of drink short. Finished about 5:30pm after which a search was made for brandy in all the bunks. Found an empty bottle but was not quick enough to find the others and a fine set-out this was. Little Wattie’s eye no better. A few birds in sight but no vessel. No concert, but a pipe and drum band marched round the gallery twice. Rose at 6:15am. A lovely morning. Two lots of sea birds floating on the sea like so many ducks. Several birds also seen flying about. Walter’s eye a little better. Put up a swing to please the children. At dinner time the cook went before the Captain for not cooking the rice. This is the third complaint this week. The doctor inclined for a conversation respecting the store room, but I was not. No vessel in sight. A concert was held forward by the single men. Wind still in our favour, but too rough for divine service on deck. But in the morning it was held down in the single women’s place and in the afternoon in the single men’s place. A few birds were seen during the day, but no vessel. Had a meat pie for dinner. Went to bed early. On watch last night 12 – 3am. Wind still in our favour. Doing from 10 to 12 knots. A flight of birds followed us all day, picking up the refuse stuff thrown overboard. Mr. O’Keef and Mrs. Pumphrey had some words. In the afternoon, one of the black pigs was killed – weight about 3 to 4 score pounds. Rather rough during the day, inclined for snow. In the evening John Ede had one of his teeth drawn. Passed a rather rough night. Fair wind. Ship going 11 knots an hour. A rainy comfortless day. Had a charcoal fire below. Walter’s eye a little better. A few birds still following the ship. No vessel in sight. The steward cut the pig up, which weighed 3 score 14 pounds, being rather lean. John Samuel a shocking bad boy. Put to bed at tea time without any tea. A fair wind all night. No rain. This morning the sun shining which is a treat to us all. Walter’s eye somewhat better. John’s throat being bad, the doctor put something to it, after which he fell down and cut his eye against the meat tin very much. The doctor was again called to him. Made two small stools today – one for Walter, the other for Harry. No vessel in sight today, but several different kinds of birds. At 8 o’clock pm, the ship going 7 knots. A wet morning, not much wind. Going 1pm at rate of five knots an hour. Walter’s eye and John’s throat very bad. A cold cheerless day – very foggy in the afternoon. No vessel in sight, but a few birds during the day. Passed a quiet night. Rose at 8 o’clock. A fine morning. Wind right aft. John and Walter a little better. Made another stool for Mrs. Humphrey. Several birds in sight during the day but no vessel. In the afternoon, spent an hour in the forecastle with Robert, James and Wm. In the morning had the rheumatism in my hips. Wm. gave me a dose for the same. Mr. Sutton made three stools. At 9:30pm the wind on port quarter. Rose at 8:00am. A wet morning. Wind on our port quarter. Going the rate of 12 knots an hour. Walter and John a little better. Took another dose of Wm’s medicine. A bird or two flying about but no vessel in sight. On the following day . . . The under steward, on going to my cabin with hot water, spilt some on the face of Kate Black, for which he received 12 stripes and a kicking from the Captain. Passed a rather rough night. A very foggy, cold morning. Ship rolling very much during the night – barrels and different things making a great noise. Wind at midnight blowing nearly a gale. Went along fine. O’Keef and Griffiths had words and a blow. The Captain came up and put a stop to it. Rain during the day. A few birds flying about but no vessel in sight. We were all mustered in the morning but no service was held. Took another dose of Wm’s medicine. John and Walter a little better. Passed a rough night. Ship hove to for four hours in a gale of wind. At 8:00am, a very large ice-berg on our starboard side, 10,000 tons in weight, about 5 or 6 miles off. A bitter, cold day, ship rolling very much. Sent everybody and everything flying. Children in bed most of the day. No vessel in sight all day but plenty of birds to be seen. Mrs. Barlow was injured by falling down, also Mrs. Howarth’s baby scalded by hot gruel in the face. Emma Jane had tea with us. On getting the water in the can had a roll over for the first time. At four o’clock, a disturbance about the biscuits. Passed another rough night. At 3am, passed another iceberg. Sea very rough. Several birds of different sorts flying about. No ships in sight. Shipped many heavy seas during the day. Our place below like a pond. Distance run 270 miles in the last 24 hours. Weather very cold. In the afternoon the steward killed one of the sheep. Walter and John much better. People and things flying in all directions. James Lind received a ducking from a sea and went to bed. Passed another night of rocking. At 11:00am shipped a heavy sea. Place below like a pond. A very cold night. Water barrels broke loose – made a great noise. A few birds in sight but no vessels. A fight between Joe the cook and the under steward about spilling a little water. This has not been much like Christmas Eve. Mr. Gibson, second mate, on fore royal yard looking for some islands. We did not go near enough to be seen. On Christmas Day, Mr. Isaacs, a first class passenger, caught and shot a Cape hen. Passed a rather rough night. A little disturbance among the crew in the ships’s galley. A fine bright morning. The mother up all night boiling the pudding for Christmas dinner, but these turned out very indifferent. Had P. meat pie for dinner. Made a Christmas tree for the doctor, which pleased the children – in the afternoon very much all kinds of small clothes being on the same. Some birds were seen all day, but no vessel. The sea much quieter. The wind on the port quarter. By the doctor’s permission, Robert, James and William came down to tea, after which a song was sung with the Barlow family. The doctor broke the party up at 9:00pm. Passed a quiet night. Slept well. Rose at 8:00am. Wind on our port quarter. Ship not rolling so much until the evening, when it began again. Very foggy in the morning. More birds flying about but no vessel in sight. Another pig killed for the cabin. Several droves of porpoises seen during the day. The pig that was killed and hung up on the mizzen rigging fell to the deck. Passed a night of rocking – no sleep all night scarcely. Got up at 8:30am. Ship went well all night. Wind shifted to our starboard quarter. A bitter cold morning. A little sleet fell. More birds in sight, but no vessel. In the night a little snow fell. Wind still in our favour. Ship sailing well. Went to bed at 9:15am. Ship sailed well all night. Not quite so much rocking. Slept a little better. A fine morning, not quite so cold. Several birds in sight but no vessel. No service held this morning, neither were the passengers mustered. A drove of porpoises round the ship. Henry Jones harpooned one, bent the harpoon and lost the fish. Jerry lost his cap overboard. Divine service held down the married place, but no sermon was preached. Went to bed about 9pm. Had a fair wind all night. Ship sailed well. A fine morning but very cold. Plenty of birds flying about but no vessel in sight. Bought a ticket of Earl, one of the seamen, for a model vessel to be drawn for, also James, Robert and Wm. In the afternoon a little sleet fell. In the evening Mrs. Isaac, a first class passenger, caught a spotted Cape hen. Passed a quiet night. Ship sailed well all night. A dull cold morning. Plenty of birds in sight but no vessel. This day passed the same as many others on board the Dunfillan. Walter and Johnnie much better. The doctor lent me the Lyttelton Times newspaper with an account of his last voyage to Canterbury etc. Ship sailed well all night 13½ knots. Not quite so cold. Several birds in sight but no vessel. Down in the single men’s compartment from 2 to 6:30pm, the hatches being up and the mates squaring up the forehole. Robert had tea with us below. At 9:45pm the matron reported the smell of fire, which turned out to be the string of a lamp burning. This caused a little alarm with a few. Woke up at midnight by the single men and crew ringing the old year out and the new one in. This was indeed a piece of Dutch chorus or rough music, for the noise was something dreadful. In the morning, Sarah Ann had a mustard poultice on her side, not being very well all night. In the afternoon saw two whales on hte starboard side. Assisted the doctor in distributing figs, nuts, apples, and books to the children, after which he draped the Christmas tree with books and pill boxes. The model ship was won by an Irishman. Turned Jerry’s number as 42. Birds in sight but no ship. No vessel in sight all day. Passed a rather sleepless night, wind in our favour. Sarah Ann better. Wm. Harris took ill in the night – had to turn in. Walter’s eye a great deal better and John quiet. The model ship was bought by Harry Jones to be drawn by 60 members at 6s each (my number 29) in the afternoon. Wheeler the seaman was cleaning the forecastle out instead of turning in, and for his pains he received a severe punching and kicking. While on the deck after having his legs drawn from under him from behind by a comrade for mislaying one of his boots, and making the place so wet, not having the time to finish before eight bells, this was cruel work. The doctor bet Mr. Isaac, a first class passenger, that he could not walk 8 miles on the ?poap? in 2 hours. But the bet was won, which was £1.00. Passed a quiet night. Wind shifted to our port quarter. A rainy morning. Wm. Harris still ill in bed. No vessel in sight but several birds flying about of different sizes. Yesterday another sheep was killed. At 4:30pm Jack the sailor and the stowaway had a fight. Jack stripped off his shirt for the purpose, but very few blows were exchanged. Joe Pumphrey put in irons for refusing to do some work allocated to him. Walter’s eye nearly well. Alice went to tea with Fanny and Janey. Passed another quiet night. A fine cold morning. Wind still in our favour. Birds following the ship. Mustered on the main deck but no service. Joe Pumphrey out for an hour’s exercise but locked up again. Service on quarter deckbut no sermon preached. No vessel n sight during the day. Emma Jane had tea with us. Ship sailed well all night, doing 11 – 12 knots an hour. A dull, wet morning. No vessel in sight but a few birds. This day passed much the same as many others. The model ship was drawn for and won by one of the first class passengers. Passed a quiet night. Wind in our favour. Killed a pig today. Weight 66lb. A few birds in sight but no ship. This day passed much the same as many others. No sleep all night until the morning. Fair wind all night. A few birds flying round the ship. Wm. Harris very ill – again obliged to go to bed. No vessel in sight during the day. Passed a quiet night. Wind still in our favour. A few birds in sight but no vessel. Wm. Harris a little better. Harry Jones bought the model ship again of the first class passenger for 15/-. Ship sailed well all night. About midnight shipped a very heavy sea, which made her stagger from stern to stern. No vessel in sight all day but a few birds. Wind on our starboard quarter. Sailing at the rate of 13 knots. Mr. ….. locked Alice in the storeroom and John in the hospital. William Harris much better. This day passed much the same as many others. A few birds in sight but no vessel. Had a fine day. This day has passed the same as many others. A few birds in sight but no vessel. No service was held during the day, neither were we mustered. John Thomas Barlow fell and cut his forehead against the winch – in the evening very bad. Wm. Harris got well. Alice went to tea with her sisters. Ship rolled very much all night. Very little sleep during the night. A fine morning. A fair wind, sailing about 8 knots. A few birds in sight but no vessel. In the afternoon killed another sheep. In the evening we had a calm. Had a ticket for the opera glass off Joseph Cawthine but Mr. Wicks won it – Carl the sailor having sold it to J.C. Went to bed at 9pm. Ship rolling very much. A good breeze sprung up at midnight and continued all day. The boxes were got up today for the last time, two of which were examined but nothing found that was missing. A bird or two flying about, no vessel in sight. Ship sailed well all night. A fine morning. At 1pm sighted the rocks called The Snares. The passengers greatly excited. Sighted Stewart Island about 4pm. Droves of birds in sight. A great many dark brown birds swimming in the water like ducks. Repaired Mary Feeney’s box side. No vessel in sight during the day. The mainland not in sight up to 8 o’clock. Packed up a few things ready for going ashore. Shipped a heavy sea while Harry was under the hatchway. He had a good ducking. A good breeze of wind all night. At 12 midnight a ship crossed our bows very close. We had no lights as usual. Got up at 5:30am. This was a great sight to us all to see the mainland. A fine morning with a shower or two. At 11:30am passed a barque bound the same course. At 12 noon we passed the town of Dunedin. R. Pumphrey lost his cap while on the forecastle deck. Several birds like ducks swimming in the sea. At 2pm took the pilot on board in the bay – Mr. ….. by name. Tacked about for some time but could not make the port owing to the wind off the land. About 7pm the tug boat came alongside, but their hawser rope not being strong enough and ours being down in the hold, the tug laid off while the same was got up. It was then too dark to venture into port. So we let go the anchor and passed the night in the bay very quiet and snug. The tug left us for the night late in the evening. This ended a day of excitement. During the day no less than 5 ropes were broken by hauling on the boatswain, and Brown and Boad were hurt during the day – Boad in the hand, Brown in the head. Passed a quiet night. Got up at 5:30am and then commenced a day of excitement for all of us. Commenced packing up our things and the bedding. Had breakfast and then looked out for the tug to take us in to port. Had a turn at the windlass and heaved up the slack of the cable. About 1pm we started for Port Chalmers, the scenery from the bay being beautiful. All passengers went on board the small steamer GEELONG and were brought up to Dunedin. George Adams coming off at Port Chalmers to meet us and came up to town with us. Landed at the jetty. Had a ….. Paid an express to take our luggage to George’s house, and one and all did justice to a good hot dinner. Arrived in Dunedin in ship Dunfillan January 16th 1874. Called on Mr. Colling Allan the immigration officer and made application for the £20 worth of land due to me for Walter and Henry (on account of me paying their full passage money out). My name was registered for the same by the officer February 10th 1874. Called again February 17th 1874. Robert and I went by train to Port Chalmers. Took boat and went to the Dunfillan about our luggage and dined aboard. Name of engine of train: JOSEPHINE.